Digital blood pressure kits are the easiest to use at home; no stethoscope is required. The display shows blood pressure (both high and low readings) and pulse rate. Knowing your pulse rate can also be helpful. Most healthcare professionals believe that home digital kits are not as accurate as the manual (non-digital) types. How inaccurate probably depends on the individual being tested, and who is doing the testing, but is especially true for the wrist or finger types, which we do not carry. You might say that digital readings are preferable, for people who might not take their blood pressure at all, unless they do it digitally. Such kits are also good for tracking changes—while their readings might differ by, say, 15 points from a carefully-done manual reading, they tend to be consistent, so you can see whether they are rising or falling, with a change in exercise, diet, medication, or mood. The photo above is of a generic digital unit, and does not show our current items for sale. BP DIGITAL KIT - SIZE L (manual inflation) - with large cuff, fits arms 14¼ – 17¾ inches around. Cuff inflates with a hand-operated squeeze bulb. The one to buy if you are on a very tight budget, when a digital kit is desired. There is no provision for an AC adapter to be used. One (1) AA battery is included. BP DIGITAL KIT - SIZE L (automatic inflation) - with large cuff, fits arms 14¼ – 17¾ inches around. Cuff inflates with a built-in electric pump. Many customers have reported that it is worth the additional cost to get away from having to squeeze the inflator bulb by hand. There is a also a possibility that if you are taking your own pressure, the act of squeezing the bulb to fill a large cuff may increase your blood pressure readings just from the effort it takes. (It takes a lot more effort to fill a large cuff than a standard-size cuff.) AC adapter optional*, but not essential. Four (4) AA batteries are included. * OPTIONAL AC ADAPTER FOR ABOVE - Most customers will not need this item, but we carry it for those who want one. Universal type - works on 120-240 volts, 50-60 Hz. 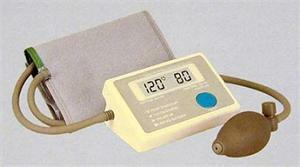 BP DIGITAL KIT - SIZE XL (automatic inflation) - with XL cuff, fits arms 16½ – 23½ inches around. Cuff inflates with a built-in electric pump. Use of an AC adapter is optional, but one is included, because inflation of an XL cuff uses up batteries faster than for a smaller cuff. The adapter is a universal type, working on 120-240 volts, 50-60 Hz. Four (4) AA batteries are included. All three types are of an advanced design that detect irregular heartbeats in people who have them. (Older units would just show an error message with such people.) Note that no home digital kits work with standard, manual cuffs. Their computer requires special cuffs designed for the particular digital kit. Please contact us by phone or email if you have any questions about these units before ordering. As with most things Amplestuff sells, these items are returnable if they don't meet your needs. If you are ordering a blood pressure kit or cuff for yourself, it is important to measure your upper arm. This can be done with a cloth or vinyl tape measure, or by using a piece of string or ribbon around your arm where it is largest, and measuring the string or ribbon with a ruler. If you are using an unmarked cuff on yourself or another person, do not assume that the cuff will give accurate measurements merely because it encircles the arm and can be fastened. It is crucial that the correct sized cuff be used.